We are a distributor of high-end brands – and we are also much more. We are an elite team committed to offering you the most responsive, comprehensive and reliable services in the industry. Our clients and associates are just like you: they are CEOs, architects, designers, project managers, builders and real estate developers. They are decision-makers, creators, visionaries. Their challenges are complex. Their expectations, high. They often give us projects that are ambitious and mark a turning point in the history of their organization and their teams. That is why, since 1992, we have continuously striven to elevate our customer service to new heights, offering our clients our unique expertise, a vast array of products and exceptional performance. At Groupe Focus, you will find an outstanding team of collaborators with a unique brand of insight ready for you to leverage. Not to mention a group of business partners who are happy to do their part to drive your success! We are determined to forge a bond of trust with our employees and our partners. Transparency and respect are values that have guided us since day one. We are true to our word: if we say it, we do it. We pull out all the stops to help our clients transform their work space. We are dedicated to providing them with impeccable service at every turn. Innovation is the cornerstone of our business strategy. Our desire to continuously push the envelope and do things differently fuels our spirit of ambition and encourages us to excel every day. We work with the best talent in the industry. The remarkable quality of our teams is one of our most valuable assets. All of our managers and advisors have come to us with an impressive track record, having worked with a number of well-known players in our market, and share an unwavering commitment to our clients. Want to help build work spaces and business environments that have a decisive impact on people’s lives? We are always on the lookout for new talent that can help boost our performance and agility. Groupe Focus has been built one project and one partner at a time. Over the years, our vision, our core values and our business decisions have made us one of the most respected distributors in the industry. Groupe Focus opens a new distribution centre in Montreal (Anjou). 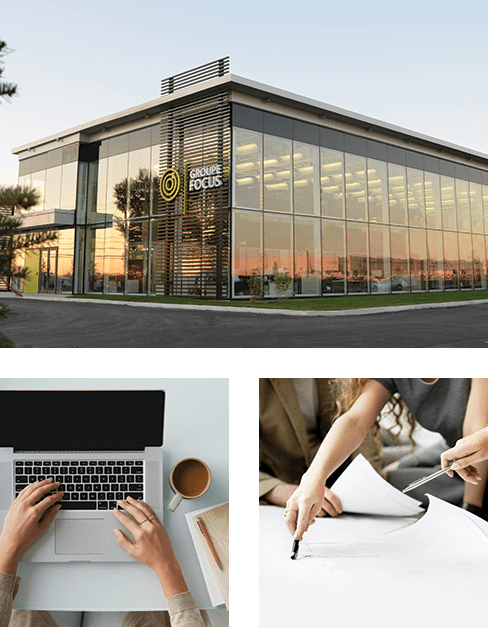 In June, Pouliot environnement commercial and Groupe Focus join forces to create a new branch office: Groupe Focus Québec. Groupe Focus proudly celebrates its 25th anniversary together with clients, partners and employees. The head office moves to Varennes. The same year, Groupe Focus makes the list of Canada’s 50 Best Managed Companies. A new branch office opens in Boisbriand to cater to clients on Montreal’s North Shore. A series of acquisitions in rapid succession confirms the company’s position as a leading distributor of furniture and modular systems. The head office is set up in Boucherville in 2001. August 3, 1992: the adventure begins, with the founding of Ameublement Focus, as the company was first known.